Pocket ORP Meters for Testing Redox in Water | Applied Membranes Inc.
Oxidation reduction is a process by which a molecule or ion loses or gains electrons. This occurs most readily in water treatment and in pool and spa maintenance where an oxidizer, such as chlorine, is added to the water to destroy contaminants. The higher the ORP value, the greater the sanitizing power of your water. 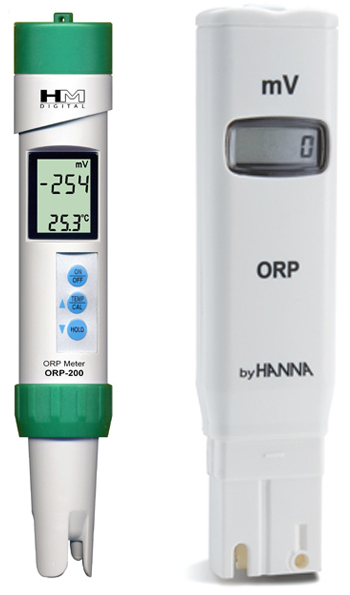 Portable pocket ORP meters are ideal for measuring the ORP of water to approximately 1000 mV. Their compact size makes them ideal for use on the go. Testing is fast and easy: Simply turn on the ORP meter, immerse it into the solution to be tested, stir gently, and wait for the ORP reading to stabilize.